The Adopt a Stream program is a way for citizens, property owners, organizations and businesses to take control of the water quality in their community. By adopting a section of stream, the group promises to remove litter from the stream banks at least twice a year. Gloves and bags are provided by us, along with the option to do biological and chemical monitoring. Currently, almost ten miles of stream has been adopted by 5 organizations in Greene County. The Adopt a Stream program is perfect for churches, civic groups, businesses, schools, and families. If you are interested in adopting or monitoring a local stream, please contact the Middle Nolichucky Watershed Alliance at mnwa.tn@gmail.com. We will be happy to host a clean-up event for you. The Clean Streams Team is a way for property owners to give back to the community while protecting the local environment. 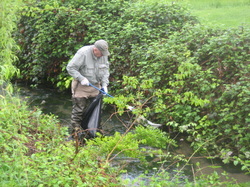 By becoming a member of the Clean Streams Team, you are pledging to keep your property clean. By committing to removing litter from your property, you are ensuring that garbage will not end up in Greene County streams after the next big rain. The Clean Streams Team is ideal for churches, schools, or businesses. For more information, please contact us by phone or email. The Nolichucky Blueway is an economic development project currently underway in Greene County. By promoting the natural scenic beauty of Greene County, we hope to increase tourism in our area. 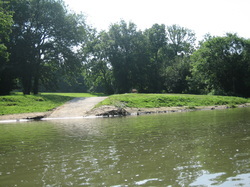 The Nolichucky Blueway is a canoe or kayak trail, complete with established river accesses to allow citizens of Greene County and anyone else who enjoys paddling access to the Nolichucky River. The Nolichucky Blueway guide is planned to be comprehensive paddling guide designed to make the Nolichucky River more accessible to canoers and kayakers across the country. The Nolichucky Blueway guide details where a paddler can put in or take out their boat, where common hazards are located (such as Crockett Falls), where you can camp, and will list several outfitters, restaurants, and hotels in the area. The guide will be complete with maps, pictures, and text detailing what you can expect when you take a paddling trip on the Nolichucky River. To see a map of the proposed plan, click here. Visit the Tennessee Valley Water Trails website to see all of the current canoe/paddle access points along the Nolichucky River. We engage in several best management practices, in both the urban and rural setting. From rain gardens and rain barrels to retention ponds and cattle exclusion, we are dedicated to working with landowners to finding a cost effective way to protect their local environment and ensure the waterways will be clean and healthy for generations to come. We try to protect the local environment by reducing the volume of runoff (water that flows over the ground after a storm), restricting livestock access to the creek (reducing E. coli), reducing erosion and mitigating the effects, and by generally reducing pollution entering our streams. We employ a variety of methods to achieve these goals and more information can be found on the "Stormwater Management" tab. 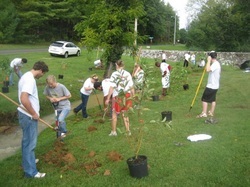 We plant thousands of trees annually, in an effort to repair and strengthen riparian zones in the Nolichucky Watershed. A properly vegetated riparian buffer (a riparian zone or buffer is the interface between a stream and the land) is critical to the health of the stream. A well vegetated riparian zone slows down the speed of runoff entering the stream, filters out heavy metals and other pollutants, and the root system helps keep dirt in place meaning there are less problems associated with erosion. Additionally, the riparian zone provides shade for the stream, meaning coldwater fish (such as trout) can live there, and provides habitat for critical animals that call a stream (and its banks) home. The advantages to healthy riparian zones are numerous. Each year, the Middle Nolichucky Watershed Alliance plants thousands of native trees along the stream banks in Greene County. Planting typically occurs in Spring and we use volunteers from local schools or organizations to ensure the trees are planted properly. We are dedicated to creating the next generation of environmental stewards. We believe that students are key to preserving the environment for generations to come. We have created specific lesson plans tailored to all ages of students. 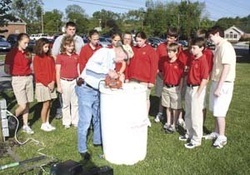 We focus on educating students on good environmental practices, how an individual makes an impact on his or her local environment, and how clean water is essential to a healthy community. We like to showcase local wildlife and other features that make our watershed unique. Each lesson plan is tailored to the individual age group of the students, with a variety of lessons and hands on activities. In addition to a classroom style education session, we also have outdoor education sessions such as Kids In The Creek, a hands on way to get students involved in water quality. During the day the students receive lessons regarding how to properly monitor water quality, the different animals that call the rivers and streams home, and the efforts undertaken to improve water quality in their community. The students also see the careers associated with the environment and conservation. If you are an educator or are in charge of a group and would like some free environmental education, please contact us. MNWA has been fortunate to have had several motivated and supportive AmeriCorps Members. We believe in taking every opportunity we can to encourage active citizenship, environmental stewardship, and learning through service. If you are looking for volunteer opportunities, please contact us. We commonly do clean-up events in Greene county. In 2014, Kristen Lane implemented a service project to maintain and expand biodiversity at the Paul E. Hayden Educational Stormwater wetland on the Tusculum College campus. We had 200 participants and 80 volunteers remove at least 2000 over-colonized cattails and begin transplanting native species into underdeveloped ponds. There were several aspects to the project including wetlands education in the classroom, formal and informal tours, active citizenship with direct service in the wetland, and encouraging teamwork among volunteers! A slideshow from all our hard work can be found below. Please contact us if you are interested in participating in a tour of the Paul E. Hayden Educational wetland on the Tusculum College campus. We are happy to accommodate groups up to 20 at a time. Tours typically last 30 minutes. We believe that the preservation and protection of Greene County's natural resource should be a priority, now and in the future. Because of this belief, the Middle Nolichucky Watershed Alliance has engaged in planning for the conservation of our natural resources in the future. We have written a plan that outlines a strategy for Quality Growth. We want to ensure that the population of Greene County can continue to expand while still protecting that which makes Greene County a wonderful place to live. The Quality Growth Assurance plan focuses on sustainable development, and making the community more accessible by building walking trails. Additionally, we have completed a 20 Year Climate Change Readiness plan. This plan details strategies for adapting to a changing climate in Greene County. The plan focuses on threats to water resources, our forests, agriculture and human health. In addition to highlighting these threats, the plan details effective strategies to help relieve some of the stresses associated with a changing climate.